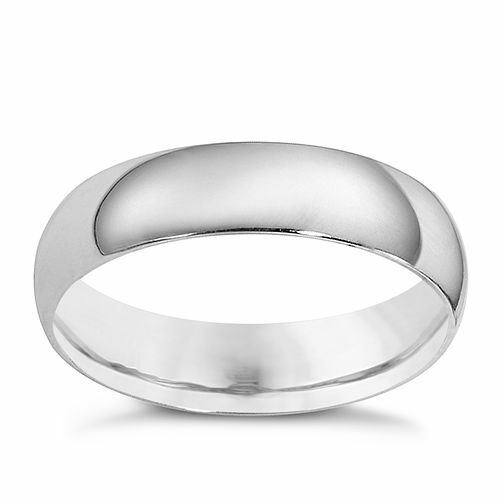 A classic plain extra heavy weight 5mm 9ct white gold court ring. 9ct white gold 5mm extra heavyweight court ring is rated 3.0 out of 5 by 2. Rated 1 out of 5 by Anonymous from Thoroughly disappointed We ordered a white gold wedding ring and paid to have it engraved with the date of our wedding. It took 2 weeks to arrive and safe to say we were very dissapointed. The ring itself was perfectly good but the engraving was shocking. Not only was it barely readable but half the numbers didn't even look like numbers and the lines didnt join up. The zeros looked more like botched up sixes. We've had to return the ring and are now waiting to have it replaced with a high chance of it not arriving in time for our wedding. We're thoroughly dissappointed. The only positive was how helpful the sales lady was at the Worcester branch. Rated 5 out of 5 by hephalump from Beautiful Great quality, beautiful. The ring is perfect and he thought it was a lovely, romantic gift.